Elizabeth DiSalvo is the founder and principal architect at Trillium Architects. She is a Graduate of Columbia University with a Masters of Advanced Architectural Design and of Rensselaer (RPI) with a five year Bachelor of Architecture and Building Science. Elizabeth has been a Registered Architect since 1993 and currently holds registration in the States of New York and Connecticut. She is a member of the AIA, NESEA, CTPH, PHNY, and the USGBC, and has been on the Board of Directors of the CT Green Building Council. Elizabeth grew up in the Architecture field in Fairfield County, CT. She has been working in architecture since 1982—her sophomore year of high school. She has worked for many high-end Architects in Fairfield County. She has also lived and worked in Los Angeles, New York, and 'off-the-grid' in Colorado, and has experience with extremely high-end modern and traditional residential construction as well as intense do-it-yourself, hands-on construction, such as straw bale and adobe building methods. Passive House, Net Zero, LEED home design, passive solar, alternative fuel sources, alternative building methods and materials, are all within Elizabeth's realm of expertise. Elizabeth speaks to both the public and the building industry on prioritizing green residential construction. Patrick graduated from Norwich University with a Bachelor of Architecture Degree. 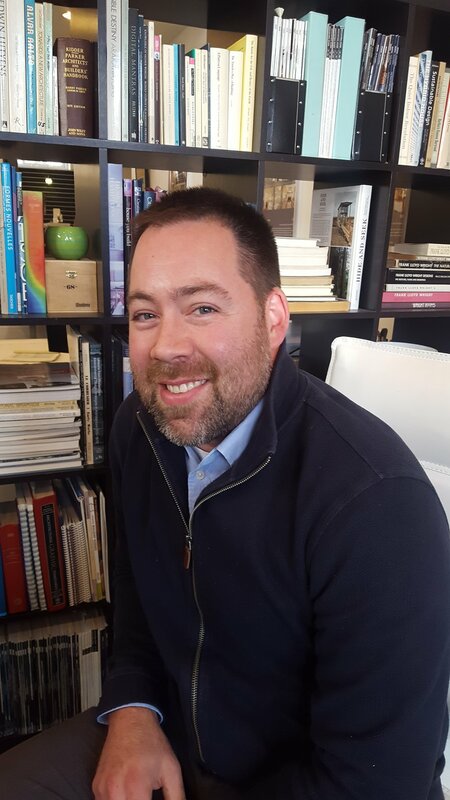 Since graduating in 2002, he has worked in both high-end residential and commercial architecture firms, with projects ranging from moderate size single family homes to family great camps in the Adirondacks, to town planning and multi-use commercial buildings. Patrick lives in Newtown with his wife, two boys and two dogs. In his free time, he likes spending time with his family, enjoying the outdoors and improving his skills as an amateur wood worker. Alex is a graduate of the University of Massachusetts Amherst, with his Bachelor’s Degree in Fine Arts-Architecture. His program specialized in environmentally sustainable design, which helped to cultivate his passion for taking better care of the planet. Alex is currently working on progressing his career through AXP experience in order to become a licensed architect. Recently having moved from Massachusetts, Alex now resides in the town of Bethel, where he enjoys drawing, spending time with friends, and hiking. Kris a licensed Architect with a Masters of Architecture and a Bachelors of Science in Architecture from the University of Maryland College Park. Her background includes commercial experience, nearly a decade in high-end residential, and the hands-on experience of home renovation. Kris enjoys making many things, with creative pursuits ranging from baking and origami to woodworking and crochet. Goia (pronounced "JOY-ah") is our office/marketing manager. She has over 20 years of business experience in marketing, administration, and customer service. She is a graduate of Iona College with a Bachelors degree in Business Administration. Goia is a local Ridgefielder who is an avid runner and indoor spin enthusiast. JoJo is the office dog, his main responsibility is emotional support, but he is also our office greeter and head of security. Most of our work is in Westchester County in New York and in Lower Fairfield County and Litchfield County in Connecticut. We have also done work in Upstate NY, Rhode Island, Massachusetts, New Jersey, Maine, North Carolina, and California. We are here to help you create the peaceful, light filled, clean and healthy house that will serve as home base for your organic lifestyle. Enter a Trillium house and breathe easy. Let the kids and dog lie on the floor. Spend your weekends doing anything but home maintenance. Enjoy the light filled open spaces. Brag about the fact that your utility bills average about $30/ month all year long. At Trillium we design intelligent quality architecture and we endeavor to cultivate beauty and delight. We are trained in and highly aware of aesthetics and the human spatial experience. We believe in designing houses that you would be proud to leave your grand children. As unique as the people who occupy them; as beautiful as the natural world that surrounds them. We believe in getting back to nature. The connection that we have with the land our house sits on can enhance our experience of our immediate environment and of nature at large. Deeper connection to nature and our immediate environment can lead to a deeper understanding of our impact upon our immediate environment as well as a deeper understanding of our house and how it works as shelter. The more our house works with its environment and the more we actively participate in the operation of our house as shelter- the longer the house will last. PASSIVE HOUSE . NET ZERO . LEED for Homes . LIVING BUILDING CHALLENGE. We have goals and ambitions for our work. We may make suggestions to enhance and improve your project that are more environmentally responsible, resource efficient, cost effective or that will manifest a healthier outcome. If you would like to know more about these subjects just ask! We love to talk about it - and we enjoy sharing all that we have learned in our years of schooling and experience. We are an 'Intentional Company'. We do honest work for an honest fee. One client calls it 'Fair Trade Architecture'. At Trillium Architects caring, high quality, well researched and thoughtful work is our base starting point. On top of that, we bring experience, technical excellence and creative thinking to all that we do. We work in a team format with our clients and contractors. We do not participate in adversarial or dishonest business practices. We believe that what you give to the world, the world gives back to you. We believe that part of building healthy, efficient and sustainable homes is maintaining a healthy, efficient and sustainable business atmosphere. We hope that our level of caring and thoughtfulness is apparent in all that we do. If you find anyway in which we are lacking, please let us know. PLEASE CHECK IN WITH OUR BLOG REGULARLY FOR THE MOST UP TO DATE INFORMATION + HAPPENINGS! Design resilient homes: We will continue to build the most energy efficient and resilient structures as are financially responsible, and to evolve the definition of these as technologies and knowledge evolve. Exceed energy codes: We will continue to only design buildings that exceed the most stringent US Energy Codes. Design for net-zero energy: 100% of our new homes will be Net-Zero or Zero-Energy Ready. Use low-embodied-energy materials: We vow to select both construction and finish material of low embodied energy in regards to all categories including but not limited to: manufacturing, production, shipping, assembly, lifelong upkeep, and landfill potential. Use healthful materials: We will continue to avoid using building materials that are detrimental to our health or our environment, including vinyl siding and spray-foam insulation. Provide excellent air quality: We will continue to ensure there is excellent Indoor Air Quality in all of our homes. Build for the future: We will continue to create ‘Forever Homes’ that people love enough to never want to tear down. Focus on quality of life: We will continue to work together to create positive, happy, work environments, job sites, homes and gathering spaces. Be an inspiration: We will continue to speak and write with the purpose of inspiring others. Be the best we can be: We vow to never stop learning and growing, with the intention of always striving to make the world a better place.